Do you have a little girl that loves to have her nails painted? Are you a girl that loves to have her nails painted? 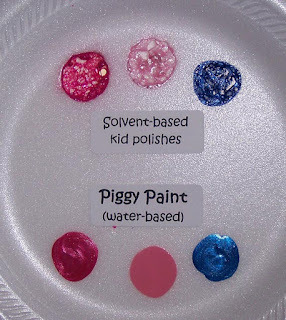 Are you ever bothered by the idea of putting such a harsh chemical on your little angels nails - especially if they occasionally end up in her mouth! 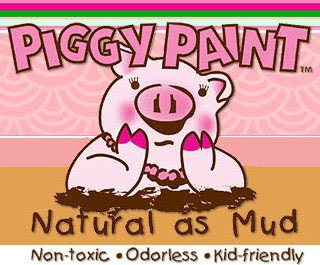 Well, Preppy in Paradise is proud to offer the coolest, most earth-friendly, non-toxic, kid-and-mom-friendly nail polish around . 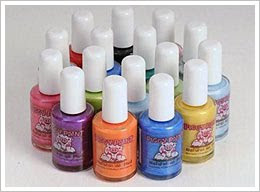 . . Piggy Paint is a non-toxic, low odor, water-based, hypoallergenic and biodegradable nail polish that dries to a hard, durable finish! This mom-created product is made from ingredients that are, literally, as natural as mud - with no harmful chemicals such as formaldehyde, toluene, phtyalates, biphenyl A, ethyl acetate or acetone. There is a huge array of vibrant colors with super cool names that your gal will love - mac and cheese (orange), angel kisses (soft pink), forever fancy (sparkly bright pink), sleepover (midnight black for those trendy gals). These are going to be hot hot hot for stocking stuffers and birthday ideas! This is a tried-and-true product that you will be very impressed with. If you really don't think you need this product, check out this picture of what regular polish does to a foam plate - I'm a believer now! Yes, that is the plate being eaten by the regular polish! I think I'm even going to start using it! For maximum chip resistance, they recommend using a blow-dryer on a medium setting to gently speed up the drying process. Check out their website (www.piggypaint.com) for any other info you might want - and then come check out the polish in person - at Preppy In Paradise - we'll also have a display at the Saint Michael's Fall Bazaar. We will be revealing a very special Gator fan color combination there!! !